The Texas Workforce Commission recently selected St. Mary’s University as one of 13 universities and community colleges to receive a grant providing student scholarships for STEM summer camps. The St. Mary’s award totaled $69,515, which covers 80 scholarships for middle and high school students interested in attending the two-week Pre-Engineering Robotics and Java Summer Camp for free. Camp director Wenbin Luo, Ph.D., Professor of Computer Engineering, has had success filling up the camp every year for the past decade. 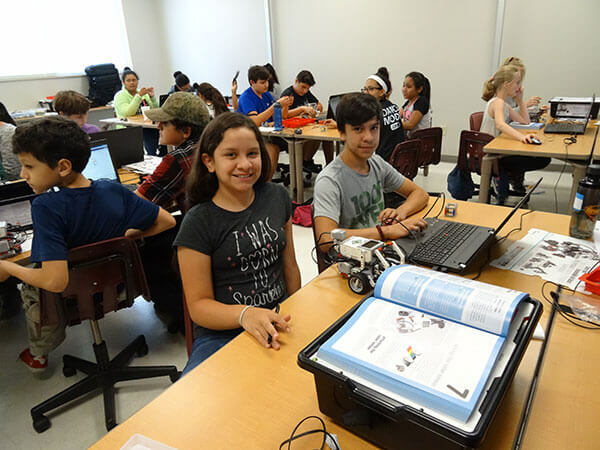 During the camp, students participate in hands-on activities involving robotics, programming and problem-solving using Lego Mindstorms NXT kits. They also take a field trip to observe engineers working in the field. Most recently, they stopped by the Southwest Research Institute, just minutes away from the St. Mary’s campus.